Of all the parks along the Lake Michigan shore, Saugatuck Dunes State Park is the one I visit most often. It is the one closest to where I live for one thing, and it is also one of my favorites as far as getting good pictures. The picture used as the header for my blog was taken there at Saugatuck Dunes on a nasty winter’s day when the wind was blowing at around 25 MPH with higher gusts. The sights and sounds of the huge waves on Lake Michigan crashing into and over the ice was something I will never forget, well worth the fight of keeping my camera from freezing from all the wind-driven spray! This park gets a lot of use all year round, it is one park along the lake where the parking lot may be full in the dead of winter. In some ways, that’s a good thing, the amount of traffic makes for easier walking when we have a foot or more of snow on the ground. And while it doesn’t seem like that large of a park, the only time it seems crowded is during the summer, as it is also a popular spot with boaters who anchor there to spend the day. The trails are great, despite all the traffic. They are well laid out, well-marked, and there’s enough variety to keep it interesting. There are four main trails out to the lake that fan out from the parking lot, that is also a picnic area. Then there are several loops with in those four main trails. Each of the main trails is somewhat different, The north trail is through more open country, while the south trail offers the most mature forests. The trails in the middle, the beach and Livingston trails are through a mixture of forest types. The south trail also takes you through some of the roughest terrain as far as how high and how steep the dunes are, but the way the trail is laid out, it is the easiest to walk. There are a couple of points along the south trail when it looks like you are going to have to climb a nearly vertical dune 100 to 150 feet high, but each time, the trail turns, or cuts through a small gap in the dunes. Of the four trails, the south one is my favorite, if I had to pick one. What I normally do is go out to Lake Michigan on one trail, then walk the beach to one of the others for the walk back to the parking lot. By combining trails and loops, you can hike anywhere from 2 1/2 miles to over 10 miles, depending on how far you want to go. None of the trails are groomed for cross-country skiing, but there is enough ski traffic to keep the trails in good shape if you prefer to ski. Another reason I go there often in the winter is the ice formations on Lake Michigan. I don’t know why it is, but there is usually more ice on the lake at Saugatuck than any of the other state parks I hike regularly. Since this is a blog that can be viewed by the general public, I suppose I need to add a note of caution about venturing out onto the ice on Lake Michigan. No matter how safe it looks, or how safe inland lakes are at the same time, Lake Michigan ice can be deadly at any time, not just when it is thawing. The wind and the waves cause the ice on Lake Michigan to move around, depending on the direction of the wind. The ice cracks, splits, and then gets jammed back together like jigsaw puzzle pieces that don’t fit together. Snow can cover the cracks up and you may think it is ice, but you could fall through a crevasse and find yourself in the very cold waters of the lake with no way to get back out. Survival time is only a few minutes at the most. The other danger is that the ice you are on can break loose from the rest of the pack and you could be stranded on an ice raft floating away from shore. It seems that every year one or two people die from falling through the ice, and several more have to be rescued from floating ice. The best thing you can do is to carry a hiking stick, or just a stick, and test the ice ahead of where you are walking to be sure it is solid. Even if you are following other people’s tracks out on the ice, especially on a windy day when the ice is in constant movement, even if you can’t see that it is. Ok, that being said, the ice formations at Saugatuck Dunes are something every one should see at least once in their live’s. 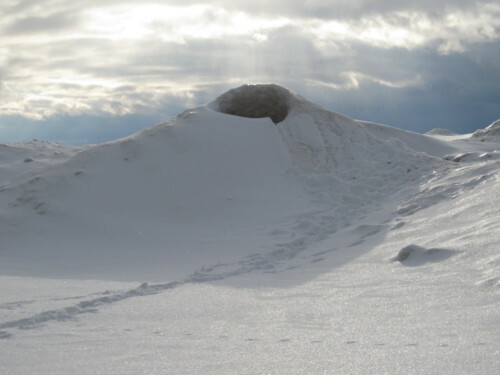 It’s the best place I have found to view the “ice volcanos” that can form on Lake Michigan. The ice volcanos look like real volcanos on a smaller scale, they are usually cone-shaped with a “crater” in the middle. They are formed by water pressure from the waves on the lake. When the wind is blowing towards the ice, it tries to force the water up under the ice. That lifts the ice pack up slightly, putting pressure on the water below. Since you can’t compress water, it needs a place to go to relieve the pressure, and it will break through weak areas in the ice, and spray out over the ice, just like a volcanic eruption. If you’re lucky, you may get to see the volcanos in action. That is most likely on a day when there is a good breeze blowing out of the west towards shore. Water, and even chunks of ice, will come surging out of the volcano’s crater from time to time, slowly building the volcano higher. 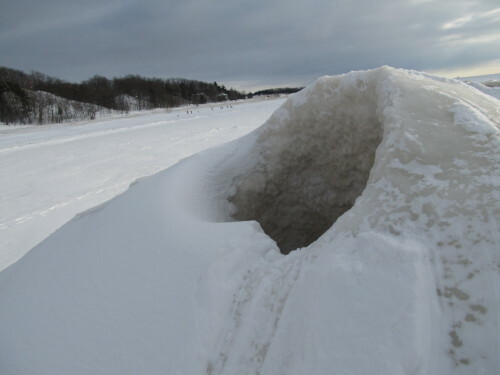 How high the spray comes out of the crater is a function of how thick the ice is, and how much wind there is trying to drive the water under the ice. Again, use caution, the volcanos form in weak spots in the ice, and there is no telling how large the weak spot is from what you can see on the surface. But it isn’t just the volcanos, it is the dunes, the lake, the ice, the whole experience there that make it one of my favorite places, and it is even a good place to swim in Lake Michigan during the summer months. Right next to Saugatuck Dunes State Park is the historic Felt mansion. The Felt Estate was once the luxurious summer home and hobby of self-made millionaire and inventor Dorr E. Felt. 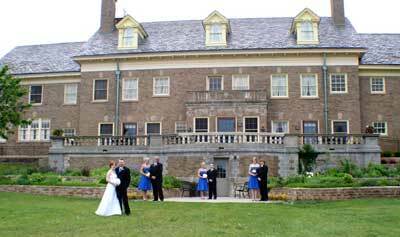 The mansion, listed on the National Register of Historic Places and the Michigan State Register of Historic Sites, retains the architectural beauty of a bygone era and offers a glimpse into the wealth and lifestyle of the Roaring 20s – a time cut short by The Great Depression. I believe it is open to the public for tours, I have never been inside, yet. There is also a county park with a frisbee golf course there at the mansion as well. Something to do after a hike in the woods if you would like.